A file with the ORA file extension is usually an OpenRaster graphics file. This format, designed as an alternative to Adobe's PSD format, supports multiple layers, layer effects, blending options, paths, adjustment layers, text, saved selections, and more. OpenRaster image files are structured as an archive format (ZIP in this case) and have a very simple structure. If you open one as an archive, you'll find separate image files, normally PNGs, in a \data\ folder that represent each layer. There's also an XML file that's used to define the height, width, and x/y position of each image, and maybe a \thumbnail\ folder depending on the program that created the ORA file. If the ORA file isn't an image file, it may instead be an Oracle Database Configuration file. These are text files that store certain parameters about a database, such as connection entries or network settings. Some common ORA files include tnsnames.ora, sqlnames.ora, and init.ora. 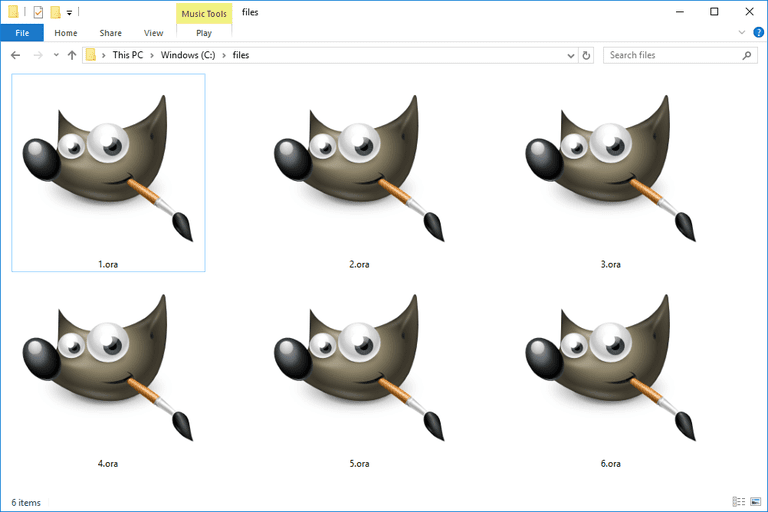 An ORA file that's an OpenRaster file can be opened in Windows, Mac, and Linux with the popular GIMP image editing tool. Some other programs that open ORA files are listed on the OpenRaster Application Support page, which includes Krita, Paint.NET (with this plugin), Pinta, Scribus, MyPaint, and Nathive. Since OpenRaster image files are basically archives, you can take a look inside one with a file extraction tool like 7-Zip. This is useful if you want to use the layers separate from the ORA file like if the program you're using doesn't support the ORA format but you still need access to the layer components. Most file extractors don't recognize the .ORA file extension, so instead of just double-clicking on the ORA file to open it with a program like 7-Zip, you'll want to first open the program and then browse for the ORA file. Another option, at least with 7-Zip, is to right-click the ORA file and choose 7-Zip > Open archive. Oracle Database Configuration files are used with Oracle Database, but since they're just text files, you can also open and edit them with a text editor. See our Best Free Text Editors list for some of our favorite picks. There are several other file extensions that look like .ORA but on a closer look are spelled differently, and therefore require different programs to open them. If you can't open your ORA file, be sure you're not confusing it with a file extension that's just one letter off, like an ORE, ORI, ORF, ORT, ORX, ORC, or ORG. Considering that this is an image format, and several programs that you may already have installed could support it, you might find that one program is set as the default program for ORA but you'd rather a different one do that job. Luckily, changing which program handles this format is easy. See our How to Change File Associations in Windows tutorial for help. You should be able to use the ORA viewers/editors from above, like GIMP, to export the ORA file to a new format like PNG or JPG. Please know, however, that doing this will "flatten" any layers in the ORA file, meaning you can't then reopen the PNG/JPG and expect to use the original images in the form of separate layers. Remember that you can extract the image layers out of an ORA file with a file unzip utility. So if you want the images in the PNG format, just extract the ones you want and you won't have to do any converting. However, if you want those layers to be in a different image format, you can convert those individual layers that you export with any free image converter. Both GIMP and Krita are able to convert ORA to PSD, retaining layer support. We don't see any reason to convert an Oracle Database Configuration file to any other format because the tools that need to understand the ORA format wouldn't know how to interact with the file if it had a different structure or file extension. However, since ORA files used with Oracle Database are in fact just text files, you could technically convert them to any other text-based format, like HTML, TXT, PDF, etc.